The Williston Basin is a 300,000-square-mile depression that includes parts of North and South Dakota, Montana, Manitoba, and Saskatchewan. Two miles beneath the surface of the basin lies a shale deposit called the Bakken Formation, where hydraulic fracturing has unlocked vast amounts of petroleum. 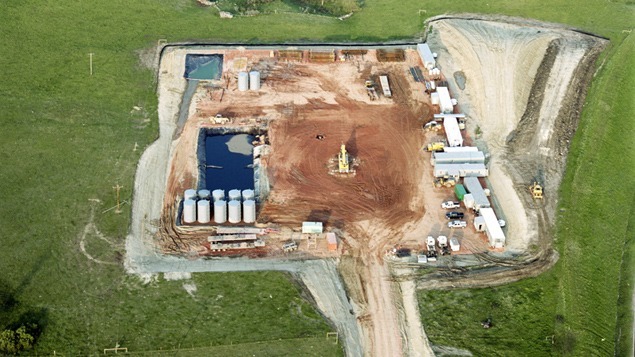 Fracturing, also known as “fracking,” pumps water, sand, and chemicals underground at high pressure to crack buried strata and force oil and gas to wells. The process is controversial because the long-term effects of the process on groundwater, ground stability, and other environmental conditions are unknown. Photographer Terry Evans and journalist/writer Elizabeth Farnsworth took cameras, geology books, laptops, and notebooks to North Dakota for 18 months to explore the effects of the oil boom on prairie and people. The project generated aerial and ground-based photographs, and extensive interviews with people on all sides of the boom. From those rejoicing in new wealth to those mourning the lost prairie, the work by Evans and Farnsworth reveals the complicated environmental, economic, and social consequences brought about by the boom.